The world is on the way to gigabit LTE. 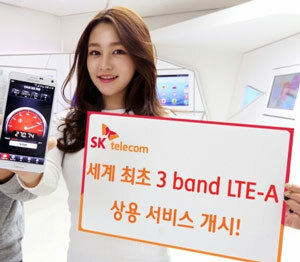 Using 40 MHz, Korea's largest mobile company is upgrading 26,000 cell sites over the next few months. The maximum speed is 300 megabits, shared; if the cell site is crowded or you're far from the tower, the speed is lower. 95+% of the time if you are well connected to the cell site, you can expect 50-100 megabits. SK is using 20 MHz in the 1.8GHz band, 10 MHz in the 800MHz band, and 10MHz in 2.1 GHz band. LG, Korea's #3, intends to deploy next month and KT is in trials. http://bit.ly/1BoDP7N. SK's 26K cellsites for 51 million people is about three times the density of AT&T or Verizon's network. The American giants have < 50,000 cellsites for 315 million people. Verizon was first, after Scandinavia, to LTE but now has a distinctly inferior network. While Germany has peak speeds often at 100 megabits, Verizon is still advertising 5-12 megabits. England, France, Finland and many others soon roll out common speeds of > 100 megabits. Stanford Professor John Cioffi offers some thoughts. WI-Fi’s extraordinary progress needs smart policy to thrive. Wi-Fi physical-layer technology is improving remarkably. Peak speeds are a gigabit or more. Several chipmakers (Qualcomm, Broadcom, Quantenna, MediaTek, Marvell, and others) advertise 1.3 gigabit (peak-speed) .ac chips, while reports of tests cite raw peak speeds as high as 10 Gbps. While these heroic physical-layer speed demonstrations attract attention, the reality of the situation suggests smart policy will be necessary for even small fractions of these peak speeds to be enjoyed in use by consumers of internet data. These high peak Wi-Fi speeds often use much of the existing unlicensed Wi-Fi 5 GHz spectrum to achieve the high advertised speeds (along with several spatial paths of that spectrum). However Wi-Fi uses a “collision protocol.” Collisions are attempts by more than one user/device/thing to use Wi-Fi on any of the access points at the same time. In this case, both “things” must wait a random period of time before attempting to transmit the same data again, leading to significant speed loss and delay in delivery of data. The more devices active, the more rapidly the performance decays. It is not unusual for the latest Wi-Fi systems advertised at Gbps speeds to actually provide only a few Mbps to devices in real use. Wi-Fi speeds can be expected to drop very significantly in neighborhoods and buildings where several Wi-Fi access points are in use with typical numbers of Wi-Fi-capable devices connected. Real world tests at 400-500 megabits. 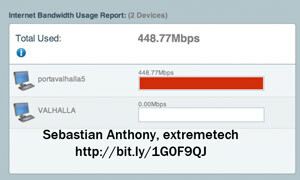 Sebastian Anthony at Extremetech tested the Linksys 1900/Quantenna getting 449 Mbps, as you can see in the picture at right. Reviewers at Amazon tested at similar speeds. Swisscom and several cable guys are very happy with the Quantenna chips; anecdotally, 9 times out of 10 Quantenna-based gateways connect the whole house at TV speeds. The full rated speed of 1.3 gigabits is actually possible if you have two of these units connected with 4 antennas each and the right environment. Update 2/23 John Cioffi reminds me that .ac achieves the highest speeds by using 160 MHz. In any crowded environment, that won't be possible. 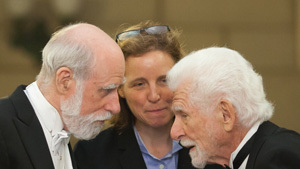 Vint Cerf, Megan Smith, Marty CooperWith congestion already a problem, do we want more traffic from telcos? Is it smart to give up 25%-75% of the bandwdith for telco LTE? "LAA" is seeing a huge push in 3GPP and elsewhere. Giant telcos want to make this happen incredibly fast although no one has done field trials to prove the sharing can work. They want to create "facts on the ground" before the regulator, much less the public, even know what's going on. 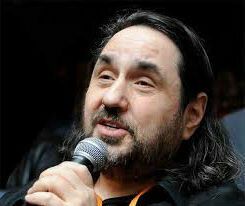 T-Mobile CTO Neville Ray says they will deploy in 2015, Verizon's Tony Melone is not far behind and AT&T is working in standards. SK in Korea and all the equipment guys are jumping on. More than half of traffic now goes on WiFi but the telcos can't charge for it in most countries. So they are moving the free WiFi calls to LTE "Assisted Access" so they can charge. If they clobber WiFi in the process, better for them. If all the current uncharged WiFi traffic moved to LTE, most phone bills would double or triple. Kevin Smithen and Will Clayton of Macquarie broke the story, which was picked by by Fierce, Jan Brodkin and Kevin Fitchard. Telcos grabbing a big hunk of WiFi is about as important a mobile story as I can imagine, but I couldn't find even a single report in a major newspaper. WSJ, NYT, WP and the Guardian haven't even mentioned LAA. 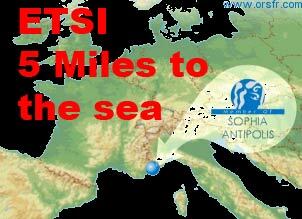 ETSI five-miles-to-the-seaBoth the U.S. and the UK have active regulatory proceedings on how to use millimeter waves for commerce, especially broadband wireless. Ted Rappaport of NYU has convincing data the technology can work and Korea, Japan & Russia are hoping to deploy in three years. Huawei is committed to spending $600M on 5G research and Europe has a $B available. It will be very big in the discussions at MWC in Barcelona and the ITU WRC this fall. Now is the time to define how this will be done. ETSI, the European standards group in Sophia Antipolis, is jumping in with what they call an "Industry Specification Group." An ISG takes less effort to set up than a formal standards group, can be set up quickly and costs less than setting up an industry trade group like BBWF or the new IOT groups. As far as I can tell from the website, membership is open. Renato Lombardi of Huawei is chair and Nader Zei of NEC Europe vice-chair. Joining standards groups often is an exceptional way to keep up with the latest research. Below, ETSI on ISG, first members of group and the official announcement. Joint venture ORN has 145 MHz of prime low band spectrum between 700 MHz and 900 MHz. This is one of the world's first wide allocations of spectrum, the most efficient way to increase capacity in the LTE and 5G era. Large spectrum blocks are the right move for capacity in any country with few wires, including India, Indonesia, and almost all of sub-Saharan Africa.